The winner of this week's presidential election, Abdel-Fattah El-Sisi, is expected to take the oath of office before the High Constitutional Court to become the ninth president of Egypt next weekend. The move comes after semi-official reports showed that the former military chief had swept presidential polls, held on 26, 27 and 28 May, achieving a landslide victory over his sole rival Hamdeen Sabahi. Initial vote tallies show that El-Sisi had secured a historic victory, winning around 95 per cent of the vote at around 23 million votes. Sabahi won a little more than 3 percent of the vote. His vote tally was so low that he was outpaced by invalid ballot papers, which numbered around 1.5 million, or around 4 percent. El-Sisi's historic margin of votes cleared the simple-majority threshold required to avoid a second run-off round. According to Abdel-Aziz Salman, spokesman for the Presidential Election Commission (PEC), which is overseeing the election, "the final official results will be announced by PEC's chairman Anwar El-Assi on 3 or 4 June, rather than (as scheduled) on 5 June, which marks the anniversary of Egypt's military setback on that day in 1967." Article 144 of the new constitution stipulates that "if there is no parliament sitting during the presidential elections, the new president must be sworn in before the High Constitutional Court." According to sources, El-Sisi will be sworn in before the High Constitutional Court either on the morning of Saturday 7 June, or a few days later. The court, located in Maadi in southern Cairo, is currently headed by Adly Mansour, a senior judge who was named interim president of Egypt after Islamist president Mohamed Morsi was ousted from office on 3 July last year. Mansour's presidency of the court is temporarily suspended while he fulfills the role of head of state. Rumours were rampant that El-Sisi's swearing-in ceremony would be delayed until 30 June, or after two laws regulating Egypt's upcoming parliamentary elections are ratified by President Mansour. The rumours were quickly dismissed by Mansour's legal advisor, Ali Awad, who denied the possibility of delaying the inauguration of Egypt's new president. Semi-official sources, however, told Ahram Online: "El-Sisi's swearing-in at Maadi's High Constitutional Court will be followed by an evening inauguration ceremony to be held at east Cairo's Ittihadiya presidential palace, expected to be attended by a number of foreign leaders, mostly from the Arab world, as well as senior Egyptian politicians, high-ranking officials, and Prime Minister Ibrahim Mahlab, whose cabinet is obliged by the constitution to resign from office after the results of presidential polls are officially announced." Sources close to El-Sisi's campaign agree that invitations were extended to some Arab leaders such as Jordan's King Abdallah, chairman of the Palestinian Authority Mahmoud Abbas, crown prince of Saudi Arabia Salman bin Abdel-Aziz, Saudi foreign minister Saud Al-Faisal, president of the United Arab Emirates Sheikh Khalifa Bin Zayed, and secretary-general of the Arab League Nabil El-Araby. Officials from El-Sisi's campaign also stressed that his historic victory was highly welcomed by a number of world leaders. They refer with particular interest to a phone call from Russia's president Vladimir Putin. A public statement by the Russian presidency on 30 May expressed Putin's congratulations to El-Sisi for his "convincing" victory in last week's presidential election, and said that the two state leaders "agreed to maintain active contacts and exchange visits at the top level." When El-Sisi visited Russia in February as Egypt's minister of defence, he was highly welcomed by Putin, who told him: "I know you have decided to run for president and I wish you luck on my own behalf and that of the Russian people." Mohamed Salmawy, head of the Egyptian Writers Union and spokesman for the committee which drafted Egypt's recently-passed constitution, believes that "Putin's very early phone call with El-Sisi is very significant because it sends a very important message to America and the West that Russia is about to regain its former strong relations with Egypt during El-Sisi's presidency." Egypt and Russia reached a military agreement few months ago, with different sources reporting that Saudia Arabia and UAE have footed the bill for an Egyptian purchase of Russian military equipment, estimated at $2 billion. Salmawy describes the reaction of the USA, and the West in general, to Egypt's post-Morsi political roadmap through the election of El-Sisi as very negative. "Not only did you have a Western media highly biased and hostile to the post-Morsi Egypt and new president-elect El-Sisi, but also Western officials who always put pre-conditions for admitting the new status quo in Egypt," said Salmawy. Other analysts, like political analyst Emad Gad of the Al-Ahram research centre, see some recent positive change of tone from American officials towards El-Sisi. Gad refers in particular to US President Barack Obama's recent speech before a US military academy on 28 May. Obama said "in countries like Egypt, we acknowledge that our relationship is anchored in security interests, from peace treaties to Israel to shared efforts against violent extremism….So we have not cut off cooperation with the new government, but we can and will persistently press for reforms that the Egyptian people have demanded." Gad notes that Obama's remarks about reforms in Egypt are vague and that they are significantly different from his previous ones in which he stipulated that the post-Morsi government achieves "an inclusive democracy" in order for his administration to resume its military assistance to Egypt. Salmawy and Gad agree that by the words "inclusive democracy," Obama and other Western officials are referring to Morsi's Muslim Brotherhood, now outlawed in Egypt. Salmawy argues that "if it is so, I think that El-Sisi was clear from the first that the Muslim Brotherhood is finished in Egypt and he will never extend a hand of reconciliation to a terrorist group." Salmawy argues that El-Sisi's victory is historic. "He got ten million votes more than Morsi got in 2012 (13 million) and this puts his new legitimacy on strong foundations and gives him a blank cheque to draw the next political map of Egypt, and he was clear when he said that those who will vote for him will vote against any future role for Muslim Brotherhood," said Salmaway, concluding that "as a result, the historic vote he got deals a deafening blow to this group and to the allegations of its officials that it holds political legitimacy to rule in Egypt." But Gad argues that while El-Sisi was clear that Muslim Brotherhood has no future in Egypt's politics, he was also keen to refrain from issuing provocative statements against the USA and the West's pre-conditions. "He even emphasised that Egypt needs the help of the US in its war against militant Islamists and that America will not be replaced by Russia as a new strategic partner," said Gad, adding that: "at the same time I think that El-Sisi will face strong internal popular pressure to allow Russia to be a counterweight force against America in Egypt." "There is a strong popular will that Egypt's El-Sisi forge closer relations with other world powers like Russia and China and that this strongly goes in favour of the country's national security and helps nullify the West's pre-conditions for reconciliation with the Brotherhood," said Gad, who expects there to be stronger cooperation between Egypt, Algeria and the military leaders in Libya in fighting any future role for the Muslim Brotherhood in north Africa. El-Sisi's campaign also refers to welcoming remarks from Algeria's president Abdel-Aziz Bouteflika, who sent a message of congratulations. Gad believes that the message reflects a shared growing sense in both Egypt and Algeria of the dangers of Islamist rule in Libya, and that there must be stronger security cooperation between the two countries to stem this tide. "There is a worrying concern in both Egypt and Algeria that Libya could be used by the Muslim Brotherhood and Al-Qaeda as a front for launching terrorist attacks against the two countries," said Gad. 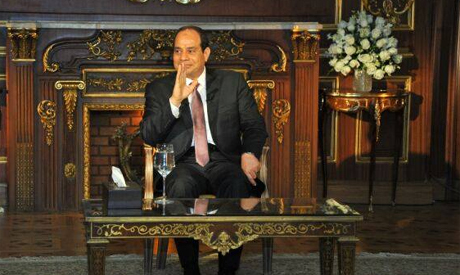 In internal terms, all agree that a politically fractious agenda awaits El-Sisi. Two new laws aimed at regulating the upcoming parliamentary elections are expected to be the first headache for the new president-elect. The two laws, whose drafts were announced on 24 May, aim to raise the total number of new parliament's seats from 508 to 630 and stipulate that 80 percent of seats be contested via the individual candidacy system, and 20 percent via party lists. Mahmoud Fawzi, a spokesman for a technical committee which took charge of drafting the two laws, said the drafts were referred to the State Council on Saturday, to be revised in legal and constitutional terms. Fawzi said that political factions were highly divided over the new two draft laws. Most political forces which came into being after the 25 January Revolution, which overthrew former president Hosni Mubarak, said they are categorically against the two drafts, insisting that the number of seats contested by party lists be increased from 20 per cent to 50 per cent upon the grounds that this helps create a balanced parliament, with most forces represented. "We will see how El-Sisi will try to reach a consensus over these two laws, without facing early accusations that he is working to serve certain factions at the expense of others," said Gad. Mr. President and our national hero: In order to become a world´s hero, Please abolish, please put an end to female circumcision in Egypt. The whole world will acknowledge your contribution to a better future in earth and women will thank you for doing it. Fake victory fake agenda .sisi and court made enough fools poor nation.and yahoods bigest agent Al baradie did his job .how to keep dark night Egyptian .baradie take advantage from public ignorancy.al baradie got full suport isreal and egypt court and army .now where is he?where is democracy ? Mr. President and our national hero: Please enforce Family Planning and birth control on anyone receives welfare. The human Bomb has exploded. It is the root of all our problems. Allah AKber. Take care. Mr. CC knows his job he doesn’t need your advice. If you are from other planet or ignorant then for your information Mr CC has already started working on family planning. Since 3rd July 2013 after removing the elected president and being de fecto ruler, Mr CC has killed 1000s of Egyptian and put more than 40,000 into the jail. So hopefully in coming few month (if he remain the president) you will change a significant decrease in Egypt population. If some escaped from CC’s family planning, he must be trying ways to escape from Egypt. Isn't better to vote for individuals than political parties? I mean look at the United States 2 party system. Washington DC I would describe as the halls of bribery. I think it is better to vote for individuals than a party. The party system is too subject to corruption, and I think that people can learn from this example of the 2 party system in Washington. Saving Egypt from terrorists was and is priority number one. General Sisi is used to giving orders and having the orders obeyed in a military fashion. The problem is that the Egyptian society has tasted freedom and they expect not only security, but for the youth of Egypt, democracy. When General Sisi starts to cut subsidies of basic goods that ordinary Egyptians depend on for their everyday survival, they will turn on him in droves. President Sadat was the hero of the 1973 war, but when he cut the subsidies, the Egyptian masses turned on him immediately. In order for Egypt’s economy to grow, subsidies must be cut. When these subsidies are cut, take out your watch because it will be just a matter of time that General Sisi will lose the support of ordinary Egyptians who will demand that he is put out of office. The media is responsible to educate people about social, economic and political issues. The media is doing now nothing to inform public about our new president vision and action. Hello, wakeup media and stop those nonsense programs.